Clifford Brown was an American songwriter and jazz trumpet player. He is the composer of two jazz standards, "Joy spring" and "Daahoud" . He has performed with jazz players as Art Blakey and Lionel Hampton before forming his own group with the drummer, percussionist and composer Max Roach. His short career ended abruptly in June 1956 because of a fatal car crash on the road for a gig at the blue note. 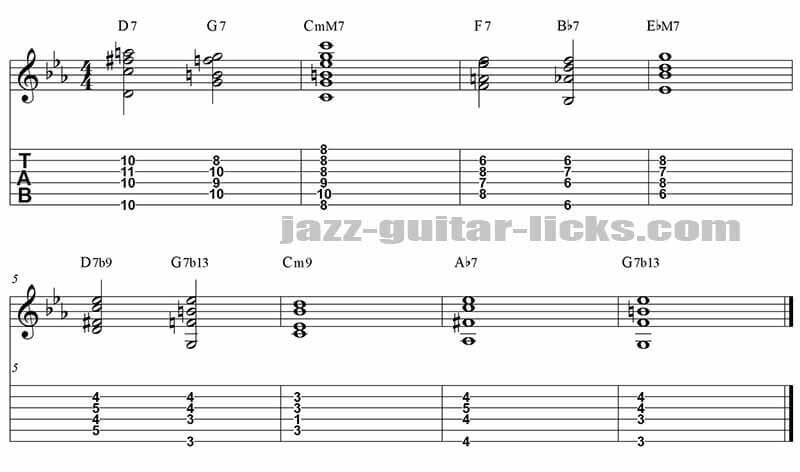 This jazz guitar lesson is focused on the Clifford Brown trumpet solo. 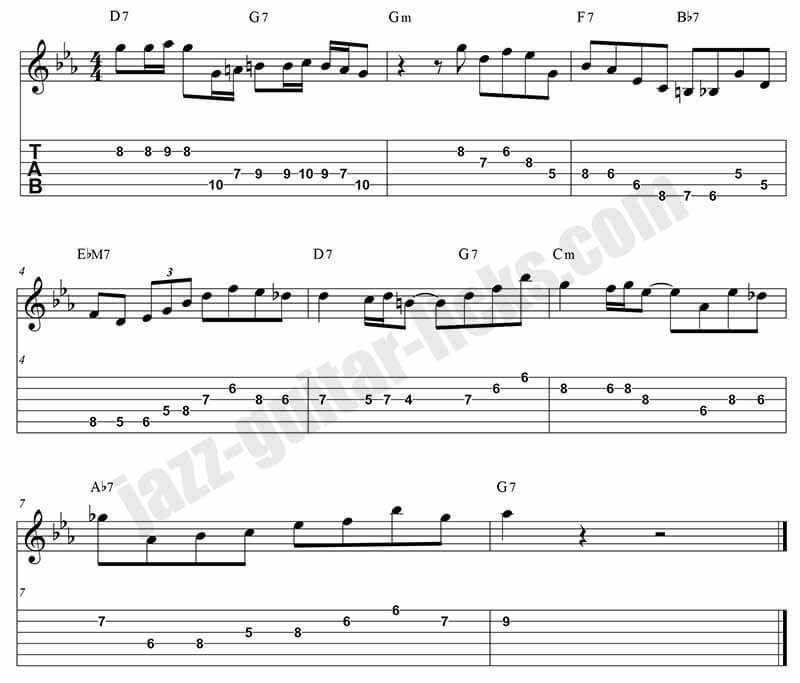 This is a transcription of the A part arranged for guitar. It starts with a II7 - V7 - Im sequence (D7-G7-Cm). It is like a C minor II-V-I progression, but with a dominant 7th chord instead of the usual half-diminished chord. In the video, you can hear D7-G7 and CmM. We could even play D7b5 - G7b9 and CmM. The following two bars (F7 Bb7 and EbM7) are a II7 - V7 - I sequence. This is a common major II-V-I progression with a II7 instead of a IIm. You can hear sequence the II7 - V7 - Im sequence again (D7-G7-Cm) in bars 5 and 6. In the video the chords played are D7b9 - G7b13 and Cm9. (Take a look at the guitar diagrams below). Then the A part is ending with Ab7 to approach G7 that is the dominant of Cm. Here are the chords played in the video. Feel free to play a more advanced rhythm comping. Bars 1 and 2: G mixolydian b13 (or b6) or Cm melodic minor mode. These modes contain the same notes. G mixolydian is the fifth mode of the C minor melodic scale. Notice that these two modes are made up of the same notes. Bar 4 : Eb major scale (Eb ionian mode) over EbM7 including a Eb major seventh arpeggio (Eb-G-Bb-D). Bar 5 & 6 : C melodic minor scale over D7 -G7 and Cm.